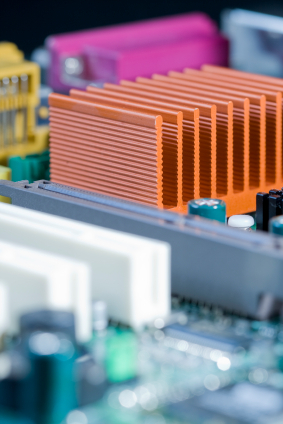 Heat sinks are important thermal management solutions in many electronic products, from computers to cell phones to refrigerators. But how many types of heat sinks are there and how do they work? This post details five common types of heat sink based on final shape and method of manufacturing. Stamped heat sinks are copper or aluminum metal that has been stamped into a desired shape. Stamped heat sinks are relatively cheap and most commonly used for low-power applications that require high-volume production. Another method for creating aluminum heat sinks is through die casting, or pouring molten aluminum into a mold of hardened steel. Heat sinks made from aluminum die casting are usually used for high density fin heat sinks. Extruded heat sinks are the most common type used today. They are made by pushing hot metal through a steel die into the desired shape. Extrusions can be made into elaborate two-dimensional shapes, allowing them to dissipate more heat, and are one of the most cost-effective thermal management solutions. Folded fin heat sinks are made from long sheets of metal, usually copper or aluminum, that are folded back and forth to produce fins, then attached to a metal base. Fins can be made flat or rounded and placed in special configurations to dissipate more heat. Folded fins are best suited to a medium to high density fin structure that is less than two inches tall. Bonded fins are created by cutting and bonding straight fins into a grooved metal base. Bonded fins tend to be thicker than folded fins, making them more efficient. Bonded fins also allow multiple metals to be used in the same heat sink to balance heat convection with weight concerns. Do You Need a Custom Heat Sink Company? Getec Industrial has over 30 years of experience in heat sink turnkey manufacturing, including aluminum extrusion design, custom aluminum metal stamping services, and aluminum die casting services for extruded profiles. For more information on our custom aluminum heat sinks, contact us online or call us at 888-999-8499.